Maria Louisa Prangley-Maria Louisa Newcombe (nee Prangley) b: 15 APR 1844 in Salisbury, Wiltshire, England. 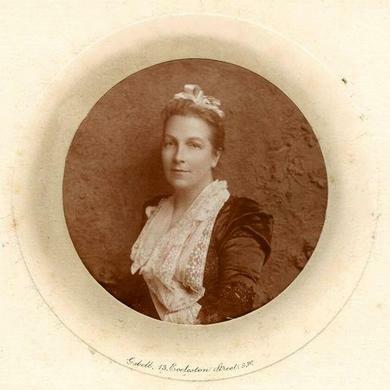 She married on 1 OCT 1873 in Ecclesall Bierlow, Yorkshire, England to Edward NEWCOMBE b: 1 SEP 1842 in Fossgate, York, England - She was a daughter of Charles PRANGLEY (Chemist) of Salisbury Wiltshire & Maria ROLLASON of Birmingham. Maria Louisa was the mother of George Harley Newcombe. Edward Newcombe Born: York, 1st September 1843 York. He married: Maria Louisa Prangley daughter of Charles Prangley, Merchant/ owner of Chemist Shop of Salisbury Wiltshire & Maria Rollason Oct 21st 1873, at Eccleshall Bierlow, Sheffield, Derbyshire. . At time of his marriage he was listed as Engineer and living in Nottingham. The Marriage was solemnized by the Rev. Arthur. Newcombe (his brother ) Present at the marriage as witness was Charles Thomas Prangley (brother), Charles M. Allport (probably "Best Man" and a son of Sir James Allport the General Manager of the Midland Railway, 1853-57 and 1860-1880., in attendance Clara M. Wilson -sister-(see below) Alice Rose Prangley -sister. Edward Newcombe was educated at Shrewsbury Grammar School. At age of 16 entered the Midland Railways locomotive department. He was assistant engineer for Chesterfield-Sheffield line and for the Settle-Carlisle line in 1870, becoming resident engineer in 1871. Went to Japan in 1873 to build first Railways and spent some time in Hong Kong. Re-joined Midland Railways in 1877 becoming resident engineer for South Wales lines. He died Jan. 17 1886. There is an obituary in the Min Proc Inst CE for 1886. he was born in York on 01.09.1843 and educated at Shrewsbury Grammar School. At 16 he entered the Midland Railway's locomotive department under Matthew Kirtley. Five years later he beacme a pupil of John Crossley. He was Assistant Engineer for the Chesterfield-Sheffield line and for the Settle and Carlisle line in 1870, becoming the Resident Engineer on that line in 1871. He went to Japan in 1873 and later spent some time in Hong Kong. He rejoined the MR in 1877 becoming Resident Engineer for its South Wales lines. He became MICE in 1878. He died on 17.01.1886"
ReL National Diet Museum. There was a very helpful man who located a book in Japanese where there was a small paragraph on Edward Newcomb (sic). He translated it for me and basically it said the following although he said that his translation would not be perfect. He was employed by the Ministry of Construction and Department of Railroad. He was employed for 3 years from 8 October 1874 to 8 October 1877 and job description was architectural engineer (probably translation not quite right here). He was paid 300 yen monthly for the first year, 350 yen per month for year 2 and 400 yen per month for year 3. It seems he was working on the Osaka to Kyoto railway. There was some reference to a document dated 20 Jan 1875 - may be this was the source document. In Pigot's Directories Wiltshire "Cymists, Druggist and Oil and Colourmen" Charles Prangley, Market Place, Salisbury Wilts 1830 and 1842. *Note: 1 Clara Maria Prangley - Clara Maria Prangley married George Wilson who became Chairman and Managing Director of Charles Cammell & Co (precursor of Cammell Laird) He and Clara lived at Banner Cross Hall, Eccleshall Bierlow Sheffield. George Wilson was born 22 March 1829 and died 1st December 1885.